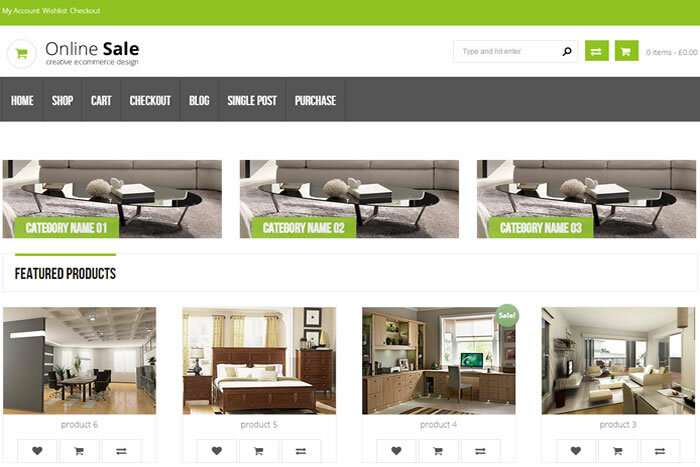 Beautiful collection of 20+ best interior decorator / furniture shop WooCommerce ready WordPress themes perfectly suitable for furniture shots and interior decorators websites to showcase their products. Have a look! Everyone who loves to make their home or office beautiful always through lovely interior design & best furniture, but creativity is the god’s gift and there will need a creative designer need to play major role to decorate your or office home exterior / interior design in professional way according your existing building structure what you have presently. Such a creative designer need a creative website to showcase their portfolio and their creative works. 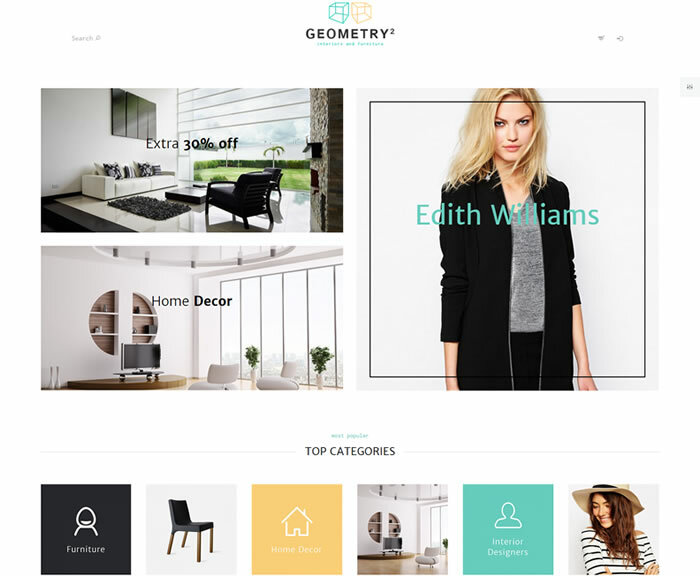 Geometry is so modern, clean & minimal interior & exterior design agencies WordPress theme also suitable for home furniture sellers, home appliances dealers and similar websites. Loaded with 4 beautiful home page layouts and compliance with HTML5/CSS3 standards. 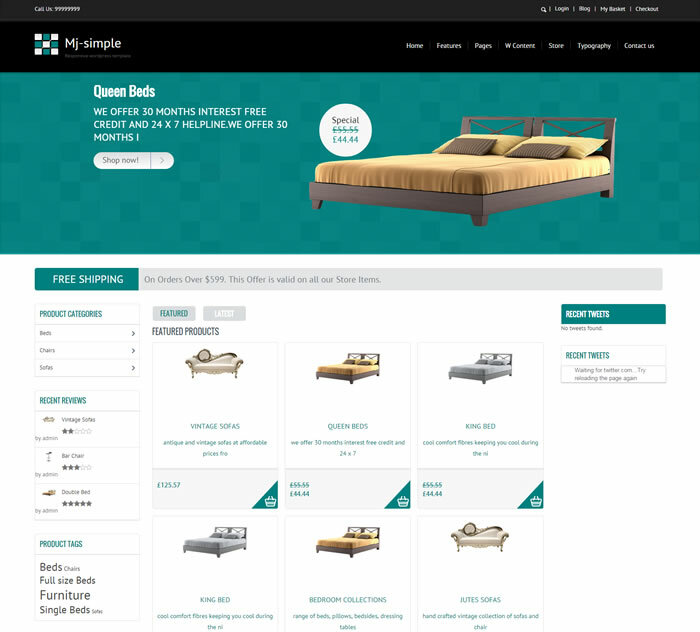 Geometry supports WooCommerce out of box which will helps you to sell furniture online. Able to switch between boxed / full width layout and assign the colour schemes so easily via theme options panel and loaded with lot of handy widgets, shortcodes, portfolio templates and included with .PO and .MO files are very handy to translate website in your preferred languages. Enabled to support famous Google web fonts, fontella icon fonts and included with custom made image icons as well. 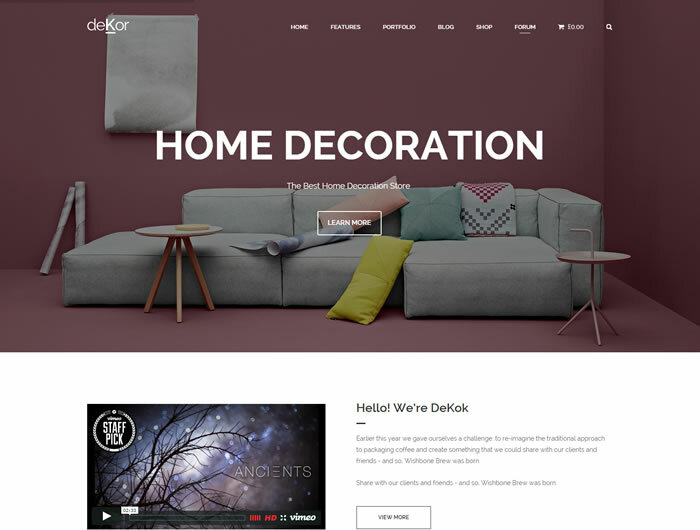 deKor is very creative and modern premium WordPress theme built for interior decoration and designers websites, event Architecture websites included to support online shopping functionality using WooCommerce shop plugin. deKor is ultra responsive, retina ready WordPress theme built using bootstrap 3 framework and compatible with WooCommerce 2.3.x, bbPress forum and WPML multilingual WordPress plugins. Comes with 5 beautiful home page variations with different header styles, page layouts, Boxed / full width layouts along with RTL language support. deKor is mega menu enabled premium WordPress theme bundled with Slider revolution (worth $18), Visual composer (worth $33) at no extra cost. Change the look and feel of your website with Google fonts and switch colour schemes via theme options panel and included with 400+ font awesome scalable icon fonts as well. Dysania is very unique, 2 in 1 dark and light WordPress theme suitable for interior designers, decoration services, creative agencies, architects websites and included with very powerful 20+ page templates. 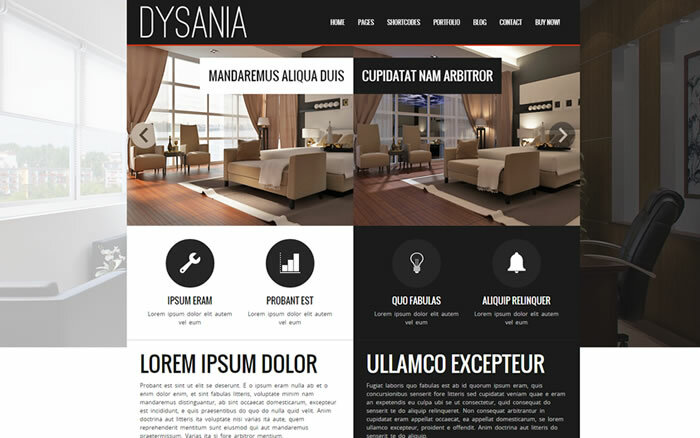 Dysania is fully responsive WordPress theme comes with 2 slider options, 4 post templates, handy shortcodes and custom jQuery, CSS3 animations that will makes your website so unique and standout from the crowd. Bundled with Dysania grid gallery (worth $17), Zeus jQuery slider ($7) plugins powers theme grid layouts and home page sliders with advanced features. Also there is working contact form, under construction & 404 page templates, .MO files and demo content XML files are very useful features of this theme. 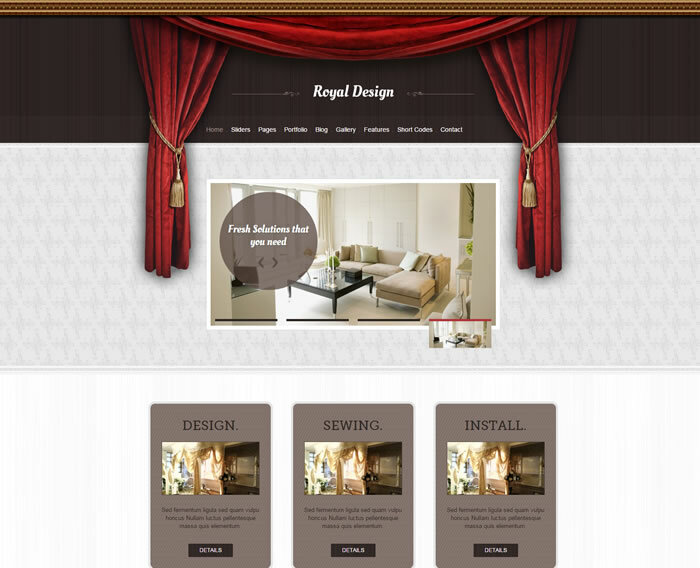 Royal design is majestic looking, very flexible premium WordPress theme fits better for decoration, interior design, curtains & fashion designers websites. Supports more than 8 different types of sliders via theme options panel and also build page specific sliders as well. Royal design is ultra responsive WordPress theme has powerful admin panel has enough options to control every element of your website and supports boxed / wide layout, unlimited sidebars, 8 footer layouts, custom background and colour options, custom post types and lot more. Also had enough options to control fonts (Google webfonts, cufon fonts or upload custom fonts) and included with beautiful gallery templates, portfolio templates, ready to use shortcodes, 15 PSD files, XML demo content and lot more. Similar Creative / eCommerce WordPress Themes You may like…. 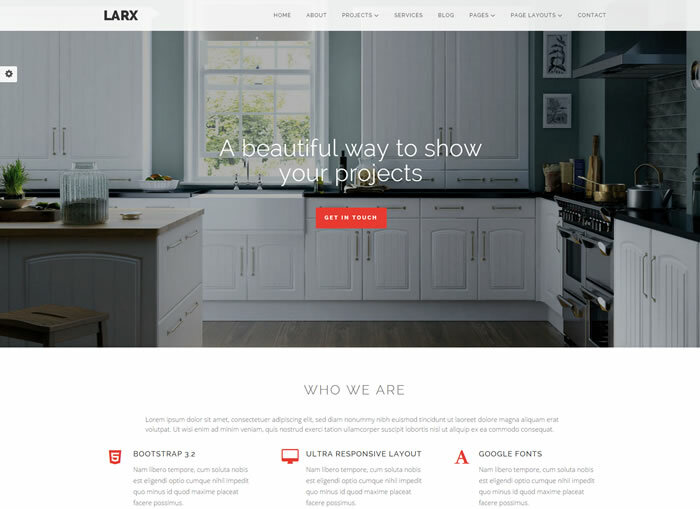 Larx is creative one page / multipage WordPress theme compatible with WordPress 4.1 and above versions and designed based on famous bootstrap 3 framework. Larx is pure responsive, retina ready multiconcept WordPress theme available with 6 built-in colour schemes along with style customizer helps you to change the look og any theme element using colour picker in seconds. Quickly add parallax sections to enhance the visual appeal or create full screen parallax sections to build stunning pages with ease. Its sticky menu enabled WordPress theme and included with fully localized files helps you to easily translate your website. Larx theme suitable creative, architecture, Personal Portfolio, interior & exterior designers websites. Bundled with Visual composer ($33), Slider revolution ($18), Cube portfolio ($9) premium WordPress plugins at no extra cost and included with Off canvas navigation menu (for mobile users), useful shortcodes, 10+ custom page templates, Google web fonts support, 400+ font awesome icon fonts, XML demo content and lot of other features as well. Like its title, Impressive is quite impressive premium WordPress theme built using bootstrap 3 framework with ultra responsive layout and retina display compliance. Built with advanced theme options make the customization process easier by configuring unlimited parameters. With impressive theme, its possible to create as many sidebars as you need and they cab be either left or right aligned. You can easily choose any key colour and font colours throughout the template by using colour picker. Loaded with custom post formats, 3 custom post types, working contact form with anti-spam test, 35+ shortcodes and lot more. Also bundled with Slider revolution (worth $18) premium WordPress plugin helps you to build responsive touch enable sliders with unique transition effects. 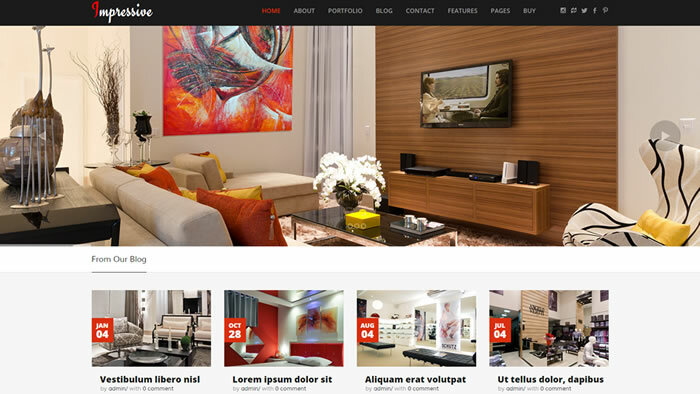 Canvas professional looking WordPress theme specially made for interior design and furniture portfolio websites and integrated with drag & drop GT3 page builder plugin. Built to support full screen image slider / video slider to showcase your eye catching presentation and interior designs powered by Slider revolution ($18) premium WordPress plugin. Create stunning albums with built-in gallery templates and build shopping sites quite easily using WooCommerce plugin support. Canvas is HTML5 & CSS3 compliance WordPress theme enabled to support Google web fonts, font awesome icon fonts and bundled with PSD files, XML demo content as well. 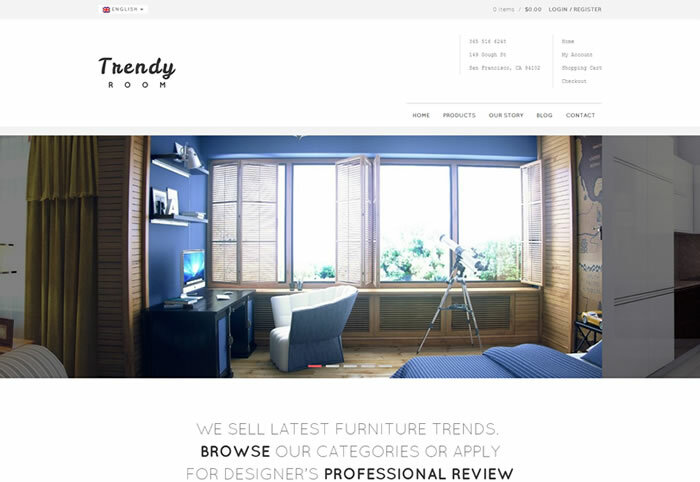 TrendyStuff is multiconcept and multipurpose WordPress theme suitable for most kind of websites including interior designers, creative agencies, automotive, construction, medical and still a lot. Change the look and feel of your website with WordPress live customizer and theme loaded with various skins and able switch them via theme options panel skin switcher. TrendyStuff has beautiful responsive layout designed using bootstrap 3 framework and comes with advanced options to fine tune header & navigation options along with unlimited sidebar support. TrendyStuff is WooCommerce ready WordPress theme available with 100% RTL languages support and bundled with Visual composer (worth $33) page builder plugin at no extra cost. 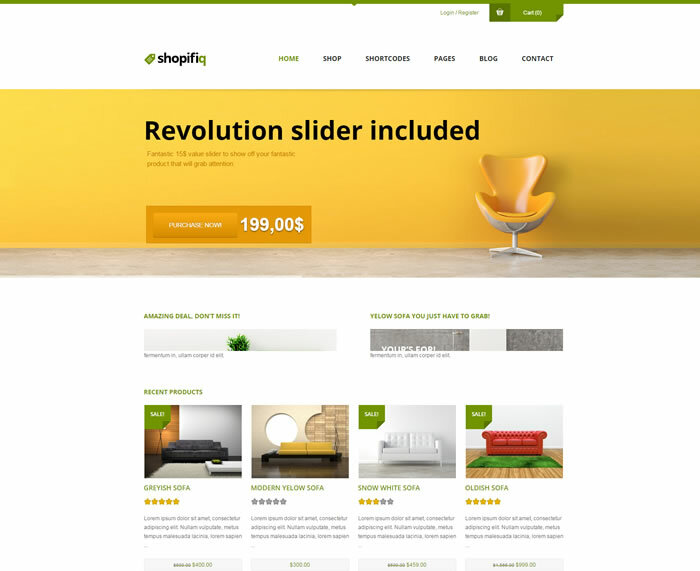 Soffa is quite easily configurable multipurpose WordPress theme available with mobile optimized design and powerful WooCommerce shop compatibility helps you to setup your online furniture shopping made easier. 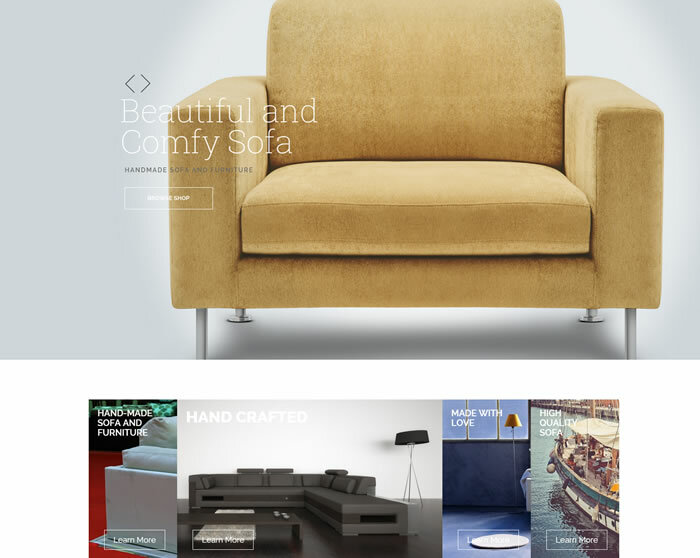 Soffa theme also suitable for interior / exterior design agencies, business and online shopping websites. Bundled with customized version of visual composer ($33) with additional shortcodes and Slider revolution ($18) premium WordPress plugins at no extra cost and included with dummy XML data is very handy to build demo website in no time. Enabled to support Sticky navigation menu makes navigation easier and supports famous plugins YITH WooCommerce wishlist, MailChimp Lite, Yoast SEO, WP super cache, Contact form 7 and lot more. 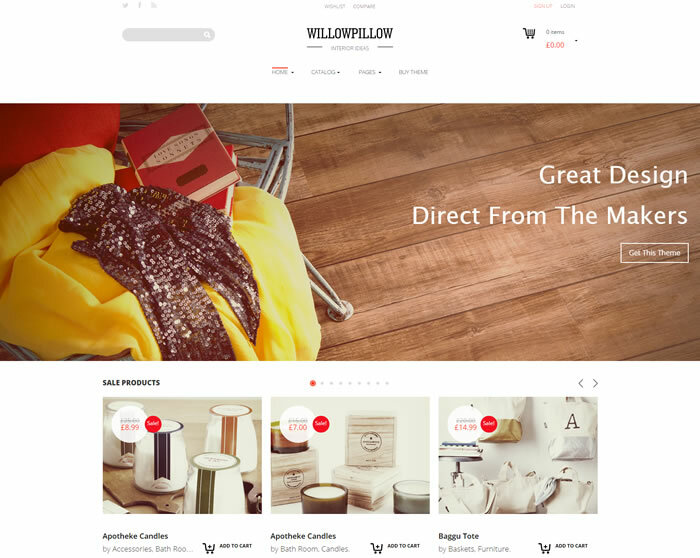 WillowPillow is unique & outstanding design premium WordPress theme made for furniture shops, interior designers, creative agencies websites. WillowPillow has fully responsive layout and it looks perfectly whether you are using huge desktop or small phone, it does not matter. Designed using bootstrap 3 framework, Compliance with HTML5 / CSS3 standards with clean and bloat free code that suits your need. WillowPillow has been designed from the ground up with translation and it comes with default .PO file containing all of the theme text strings are ready to translate in your desired language. Enabled to support WordPress live customizer to change and adjust everything with real time preview and WillowPillow is fully compatible with WooCommerce plugin and included with all necessary features to run the online shopping site with ease. Trendy Room is clean & very minimal premium WordPress theme loads very fast even in shared hosting environments and Google really loves it. Suitable for furniture shops, interior decoration, design and creative agencies websites. Powered by SiteOrigin page builder WordPress plugin and designed using bootstrap 3 framework assures 100% ultra responsive layout fits perfectly across all kind of device displays. Enabled to support WooCommerce shop (2 shopping layouts available), WPML multilingual WordPress plugins and included with portfolio templates, XML demo data, handy custom widgets with amazing typography options and bundled PSD files as well. Online Sale clean & green eCommerce WordPress theme powered by famous WooCommerce WordPress plugin. 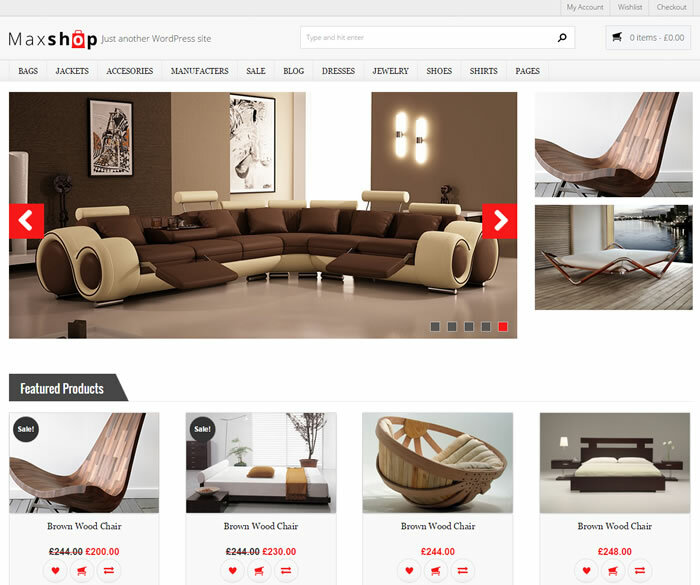 Its fully widgetized premium WordPress theme suitable for furniture & home appliances online shop websites and theme has white label theme options panel. Easily configure and upload custom logo and favicon image with and able to setup your own colours with unlimited colour options. Online Sale eCommerce theme included with under construction page template, blog section and able to create unlimited Sidebars and assign to specific pages or assign theme globally according to your need. Online sale is multilingual ready eCommerce WordPress theme bundled with .PO files and enabled to support from 400+ Google web fonts and 300+ font awesome icon fonts. MaxShop is HTML5 / CSS3 compliance eCommerce WordPress theme built using bootstrap 3 frontend framework with ultra responsive layout fits perfectly across all kind of device displays. Included with visual shortcode generator straight from WordPress WYSIWIG editor and integrated with HTML5 audio / video player. MaxShop theme has 1-click demo data and supports unlimited colour options, Google web fonts and font awesome icon fonts. Its search engine friendly, cross browser friendly WordPress theme compatible with WooCommerce 2.0+ above versions and bundled with all PSD files used to develop MaxShop theme. 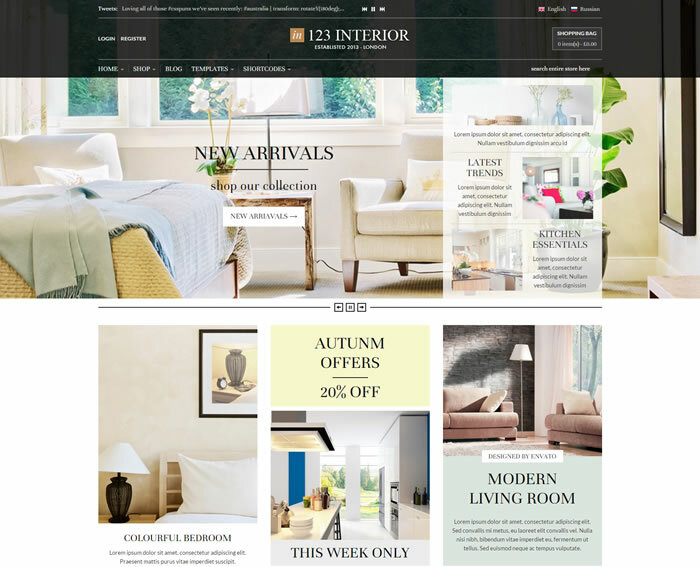 123Interior is so powerful and elegant looking WooCommerce WordPress theme built using bootstrap 3 framework (1140 pixels width) with ultra responsive layout. Suitable for online shopping websites and theme available with 9 different page variations including 6 Shop page variations, 2 blog section variation and one corporate variation as well. 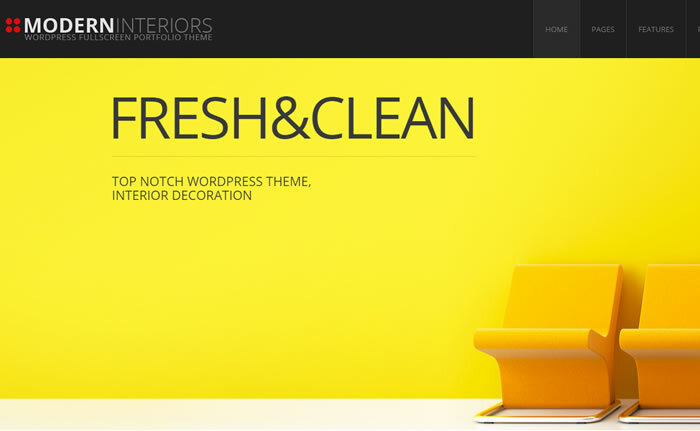 123interior is multilingual ready eCommerce WordPress theme included with .MO / .PO files, compatible with WPML multilingual WordPress plugin and bundled with customized version of Visual composer (worth $33) drag n drop page builder premium WordPress plugin with 6 additional WooCommerce content elements at no extra cost. Modern Interior is fresh looking 100% responsive, retina ready WordPress theme comes with full screen slider powered by flex slider jQuery plugin and theme designed using bootstrap 3 front end framework. Powered by Easy to use and intuitive Drag & Drop GT3 page builder Included with tons of shortcodes, drag n drop page modules and bundled with Layer slider (worth $17) premium slider plugin. Its HTML5 / CSS3 compliance WordPress theme comes with advanced theme options panel helps you to setup boxed or full width layout. Its search engine friendly, cross browser compatible WordPress theme has various page layouts with custom background support. Setup demo website with one click demo installer and has powerful shortcodes, custom modules, custom widgets, gallery / portfolio templates along with Google web fonts support. MJ simple classical & stylish HTML5 / CSS3 compliance WooCommerce WordPress theme built with solid bootstrap 3 framework with 960px grid system. 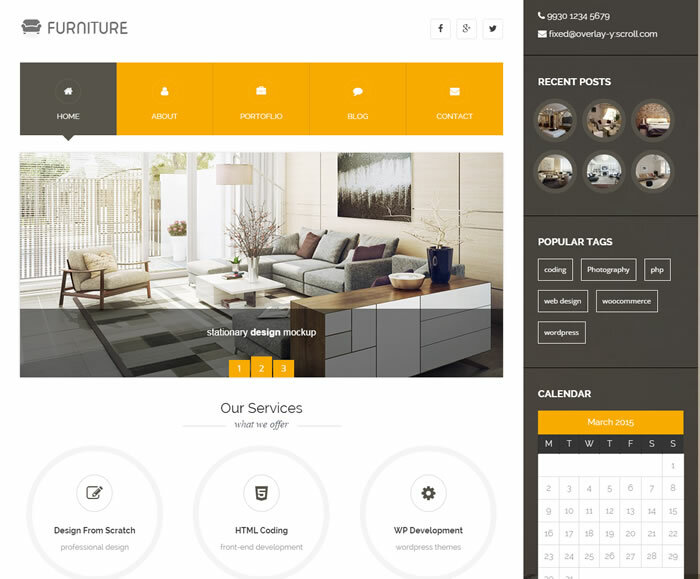 MJ simple theme suitable furniture, home appliances shopping websites and also great fit for corporate, Business, Portfolio and Technology websites as well. MJ simple is 100% responsive, retina ready, ECWID ready eCommerce WordPress theme comes with 8 colour variations and included with powerful custom widgets, social media support and lot more. Included with unique page templates (FAQ page, 404 & 303 error page) and theme built to support Google web fonts and Google maps as well. Cleanway is fresh looking & feature rich multi purpose WordPress theme loaded with 10 catchy colour schemes and supports unlimited colour options. Its fully responsive, retina ready WordPress theme is very easy to customize and comes with plenty of shortcodes, handy custom widgets and tons of features, it is something you need. Cleanway is HTML5 / CSS3 compliance multi purpose WordPress theme is included with .PO and .MO files for translation and able to setup demo website straight from theme options panel just a click away. Its cross browser compatible, search engine friendly multi purpose WordPress theme bundled with most selling Slider revolution ($18) premium WordPress plugin at no extra cost and theme support 3 level drop down menu for quicker navigation. LookShop is clean & stylish, responsive eCommerce WordPress theme powered by WP eCommerce plugin. Its most popular, most robust eCommerce plugin for WordPress and is the ideal way to sell products, downloads or services online. 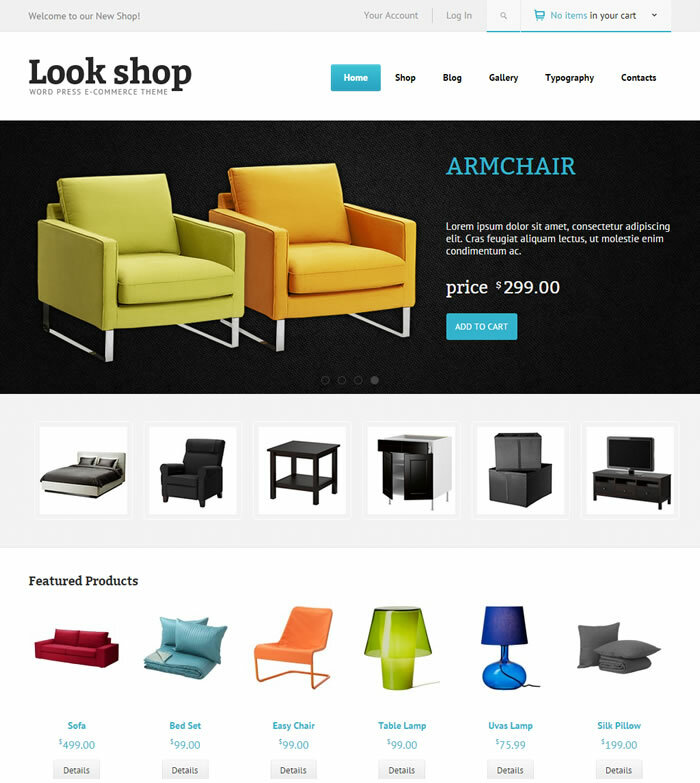 LookShop theme suitable for furniture, home appliances and apparels shopping sites and it has perfect responsive layout built to resize and realign itself to cater to different sizes of mobile devices such as smartphones and tablets. LookShop is HTML5 /CSS3 compliance WordPress theme comes with layered featured products slider and super flexible featured products widget allows you to easily add features products to home page as well as control image size as well. Included with improved filterable image gallery to showcase images with awesome add-ons, filter, captions and its blog section has multiple blog layout options. 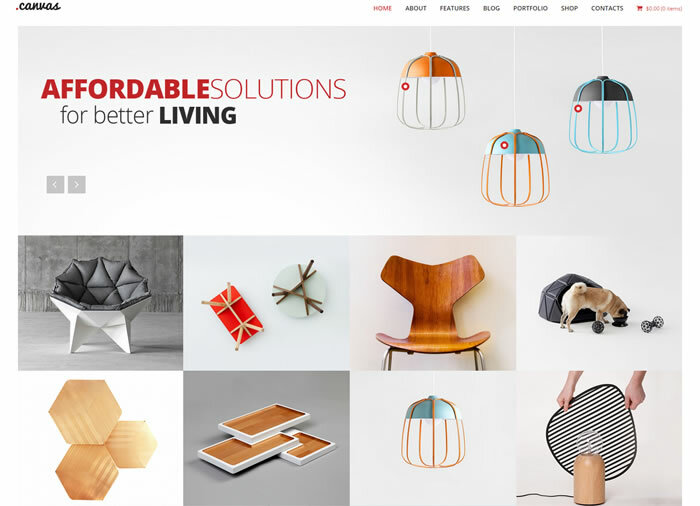 Koorsi is clean & minimalistic WooCommerce WordPress theme perfectly suitable for furniture & apparel shops, portfolio, business or any other eCommerce sites. Powered by Hybrid Core framework and compatible with WooCommerce 2.3.x and above versions as well as the bbPress forum plugin as well. Koorsi is perfect responsive WordPress theme adopts automatically to any device used by your website visitors whether its a PC, tablet or cellphone. Also you can easily using alternative skins available via WordPress theme customizer without any advanced coding updates. Build your eCommerce site so easily in 3 simple steps to build your own online store. Shopifiq is clean and powerful, fresh looking WooCommerce WordPress theme ready to present your products to clients. Comes with 5 unique home page variations, 10 beautiful colour variations and bundled with Slider revolution ($18) premium slider plugin to show off your fantastic product to grabs user attention in style. Its mega menu & sticky menu enabled WordPress theme comes with powerful theme options panel and also available with lot of shortcodes, custom widgets, 8 blog templates and beautiful portfolio templates as well. Shopifiq is Google friendly, cross browser compatible WordPress theme compliance with HTML5 / CSS3 standards and bundled with .PO and .MO files helps you to translate website in your preferred language. 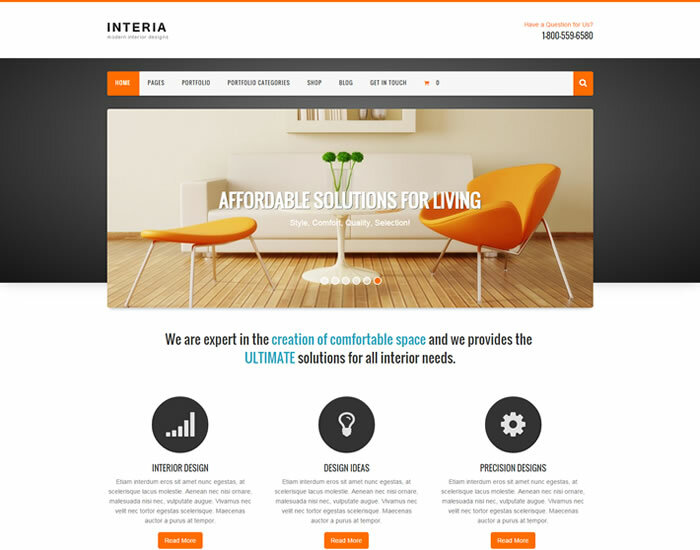 Interia is most successful interior designers WordPress theme also fits well for creative agencies, furniture shopping sites. Interia has very powerful and flexible SiteOrigin page builder, let you create professional looking pages on fly without any coding skills. Its has WooCommerce powered shopping cart and comes with various post type templates to publish standard, gallery, link, quote, video, audio and bundled with XML demo content is very handy to build demo website just a click away. Interia is ultra responsive, retina ready WordPress theme is HTML5 / CSS3 compliance and coded with perfection. 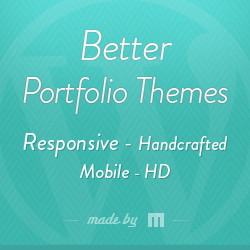 Its parallax enabled WordPress theme built to support elastic slider, BX slider and 700+ google web fonts as well. We believe that above WordPress themes really handy and fulfill your needs to your creative website. If you find them very useful for you, Say thanks through below comment form and also share this post through social media sites using below share buttons. In case if you found any broken links, don’t hesitate to notify us via below comment form.